Chitradurga ( also known locally as Durga) is a city and the headquarters of Chitradurga district which is located on the valley of the Vedavati river in the southern part of the Indian state of Karnataka. It is located about 200 km from the state capital Bengaluru. Chitradurga gets its name from Chitrakaldurga (or Picturesque castle), an umbrella-shaped lofty hill found here. Chitradurga was also known by the names Chitradurg, Chitrakaladurga, Chittaldurg. Chittaldrug (or Chitaldrug) was the official name used during the British rule. 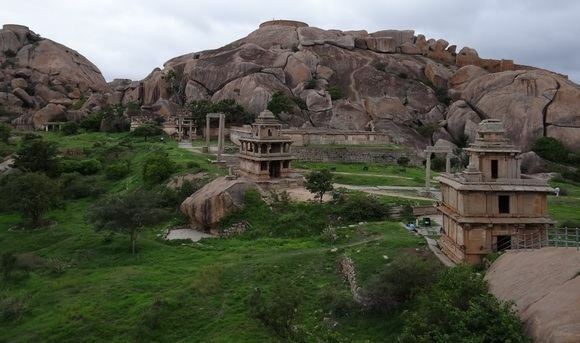 Chitradurga features bold rock hills and picturesque valleys, huge towering boulders in numerous shapes. It is known as the "stone fortress" (Kallina Kote). According to the epic Mahabharatha, a man-eating Rakshasa named Hidimba and his sister Hidimbi lived on the hill. Hidimba was a source of terror to everyone around while Hidimbi was a peace-loving rakshasa. When the Pandavas came with their mother Kunti in the course of their exile, Bhima had a duel with Hidimba in which Hidimba was killed. Thereafter Bhima married Hidimbi and they had a son named Ghatotkacha who had magical powers. Legend has it the boulders were part of the arsenal used during that duel. 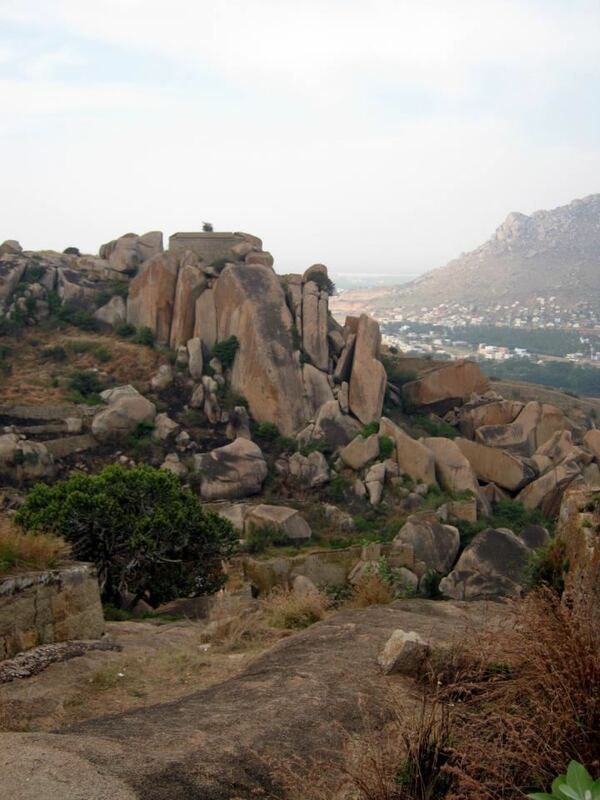 In fact, the boulders on which major part of the city rests belong to the oldest rock formation in the country. 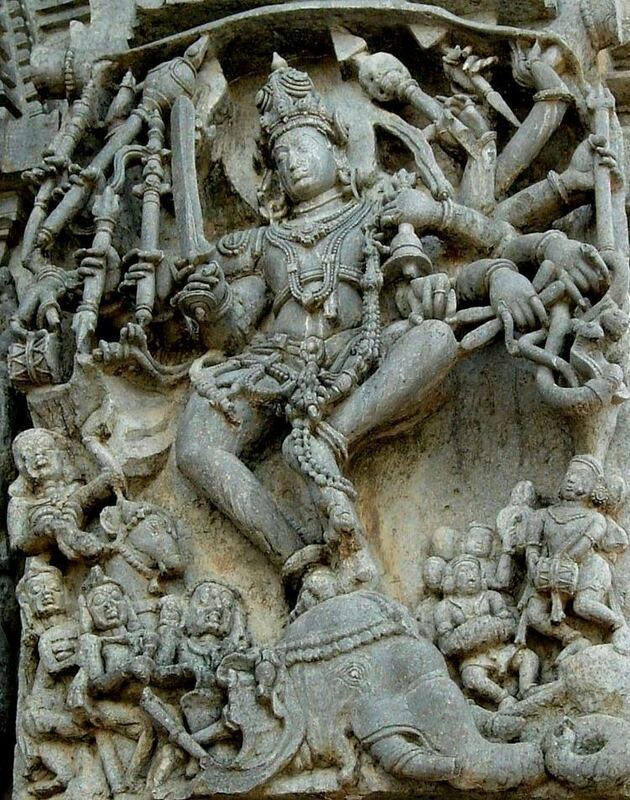 Timmana Nayaka, a chieftain under the Vijayanagar Empire, rose to the rank of governor of Chitradurga as a reward from the Vijayanagara ruler, for his excellence in military services,. This was the beginning of the rule of the Nayakas of Chitradurga. His son Obana Nayaka is known by the name Madakari Nayaka (1588 CE). Madakari Nayaka's son Kasturi Rangappa (1602) succeeded him and consolidated the kingdom to rule peacefully. As he had no heirs to succeed him, his adopted son, the apparent heir was enthroned but was killed in few months by the Dalavayis. Chikkanna Nayaka (1676), the brother of Madakari Nayaka II sat on the throne, and his brother succeeded him with the title Madakari Nayaka III in 1686. The unwillingness of Dalawayis to accept Madakari Nayaka III's rule gave an opportunity to one of their distant relatives, Bharamappa Nayaka to ascend the throne in 1689. He is known as the greatest of the Nayaka rulers. The subjects of Chitradurga did not experience a good reign of the successive rulers as they ruled on the throne for very brief periods. The Hiri Madakari Nayaka IV (1721), Kasturi Rangappa Nayaka II (1748), Madakari Nayaka V (1758) ruled this area but there is not much to mention of their rule. During the reign of Madakari Nayaka, the town of Chitradurga was besieged by the troops of Hyder Ali. 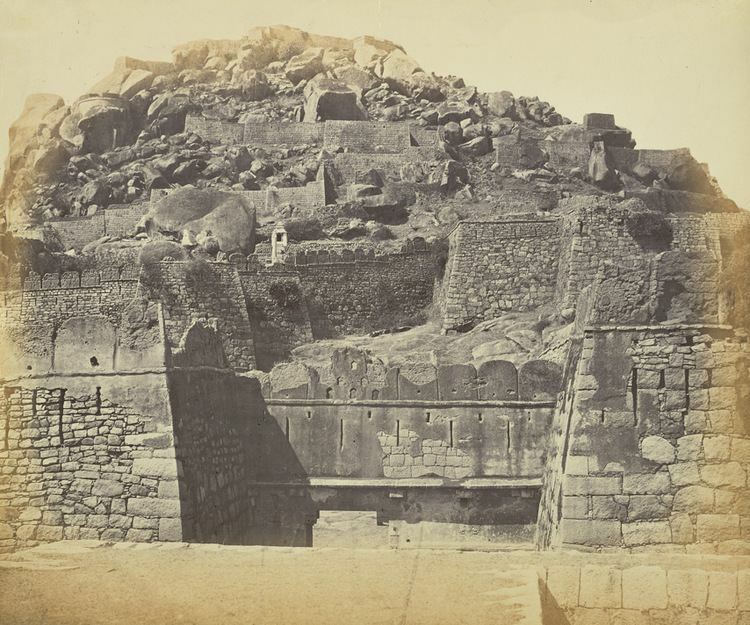 A chance sighting of a woman entering the Chitradurga fort through an opening in the rocks led to a clever plan by Hyder Ali to send his soldiers through the hole. The guard on duty near that hole had gone home for lunch. The wife of that guard, Obavva was passing by the hole to collect water, when she noticed soldiers emerging out of this opening. Obavva was not perturbed. She was carrying with her an Onake (a long wooden club meant for pounding paddy grains). She killed Hyder Ali's soldiers one by one as they attempted to enter the fort through the opening and quietly moved the dead. Over a short period of time hundreds of soldiers entered and fell, without raising any suspicion. Obavva's husband, upon his return from his lunch was shocked to see Obavva standing with a blood stained Onake and hundreds of dead bodies of the enemy around her. Together both wife and husband beat up most of the soldiers. But as both of them were about to finish off all the soldiers of Hyder Ali, Obavva dies. The opening in the rocks still remains as a historical witness for the story, beside The Tanniru doni the well which Obavva was making her way to, when she found the soldieres of Hyder Ali. Though her brave attempt saved the fort on that occasion, Madakari Nayaka could not repel Hyder Ali's attack in 1779. In the ensuing battle, the fort of Chitradurga was lost to Hyder Ali. Obavva, like Kittur Rani Chennamma remains a legend, especially to the women of Karnataka. Chitradurga is located at 14.23°N 76.4°E﻿ / 14.23; 76.4. It has an average elevation of 732 metres (2401 ft). Chitradurga city is well connected to Bengaluru, Mysuru, Davanagere, Hubballi, Hospet, Bellary, Shivamogga, Mangaluru, Tumakuru, Vijayapura, Belagavi,...,etc. by Bus through KSRTC. Both NH-4 & NH-13 meets at Chitradurga City. Chitradurga city is well connected to Bengaluru, Mysuru, Davanagere, Hospet, Bellary, Tumakuru,...,etc. by Bus through Railways. The climate here is considered to be a local steppe climate. During the year, there is little rainfall in Chitradurga. The Köppen-Geiger climate classification is BSh. The temperature here averages 25.3 °C. The rainfall here averages 576 mm. As of 2011 India census, Chitradurga had a population of 1,25,170. Males constitute 51% of the population and females 49%. Chitradurga has an average literacy rate of 76%, higher than the national average of 59.5%; with male literacy of 80% and female literacy of 72%. 11% of the population is under 6 years of age. Chitradurga city is administered by the Chitradurga city municipal council. Chitradurga situated in a hilly region is also known to experience wind currents throughout the year making it a suitable place to set up wind mills and wind farms. There are several Wind-Power based power plants located around Chitradurga and most of the hills are embellished with wind mills which can be seen while entering the city. These wind farms have a total installed capacity of 49.7 MW and comprise a total 18 Vestas 1.65MW wind turbines supplied by Vestas Wind Technology India Pvt. Ltd and Suzlon Energy Ltd.
Chitradurga Fort was built between the 10th and 18th centuries by the kings various dynasties during that period which are Rashtrakutas, Kalyana Chalukyas, Hoysalas, Vijayanagar and Nayakas of Chitradurga. After Nayakas lost it to Hyder Ali in the year 1779, the fort was given its finishing touches by Hyder Ali along with his son Tipu Sultan. It comprises a series of seven enclosure walls in Kannada. On the upper part of the fort Eighteen ancient temples can be found and in the lower part of the fort there is one huge temple. Among these temples the oldest and most interesting is the Hidimbeshwara temple. The masjid was an addition during Hyder Ali's rule. The fort's many interconnecting tanks were used to harvest rainwater, and the fort was said to never suffer from a water shortage. This seemingly impregnable fort has 19 gateways, 38 posterior entrances, a palace, a mosque, granaries, oil pits, four secret entrances and water tanks. Chandravalli caves is located amidst three hills namely Chitradurga, Cholagudda and Kirubanakallu. These caves are a never-ending maze of steep steps that lead into passageways, rooms and ante-rooms where kings from the Kadamaba, Satavahana and Hoysala dynasties resided. And saints of the Ankali Math of Belgaum meditated in the temples. These caves are well ventilated but there is no light as its pitch dark inside the secret rooms that's why the kings used these rooms in case there was a threat of an intrusion.